When I first met Sebastian Kadlecik at the Southern California Creators Unite event, I was lucky enough to get a quick preview of the comic he had created with his partners John Bring and Lindsay Calhoon. I was ecstatic over the idea of a comic featuring Penguins and Possums doing human things. After reading the first as well as the second issue (which premires at Long Beach Comic Con this coming up weekend), I was conflicted. I love the idea of this story. 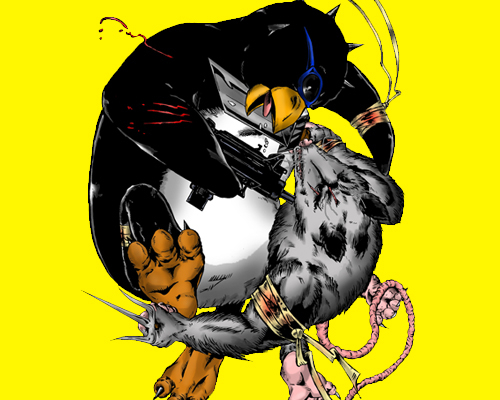 The premise is Penguins and Possums have been eternally at war, for no reason other than they don’t like each other. It is rich with a history that you know exists, but isn’t immediately shoved in your face, and characters that have potential to grow and expand. However, I felt as though the relationships, the personalities and the story was a bit rushed. It was difficult for me to take a definitive stance on whether or not I enjoyed this comic. Technically speaking my only issue with the art was that the first issue was solely black and white and there was no grey scale, but was pleased to see that the second issue was in grey scale. The black and white was very reminiscent of manga, and I found myself trying to read it right to left. The grey scale helps to add to the over all mood of the comic. What it does well is create a world and a situation that is so ridiculous and out there, but so serious and ernest in it’s mythos that it makes you forget that penguins and possums really haven’t been at war since the beginning of times. As a huge fan of epic fantasy novels with strong tortured leads, I find myself wanting a more dynamic character with depth. I am sure that as the story progresses each character will find their voice and they will start to develop naturally, but as of right now the character development feels a little forced. This is something that can be fixed over time. With an interesting concept that reminds me vaguely of Redwall and the potential to grow and improve, this comic has me interested. I am genuinely excited to see how the writers and artists improve and grow within the stories. The only thing I really hope I see is a slower pace in later issues. These characters have a lot of potential, and I want to savor the development. And if you are going to Long Beach Comic Con, make sure to stop by and grab Issue One if you don’t have it, as well as Issue Two. They will also be part of the Super Indie Comics Panel at noon on Sunday, so be sure to stop by and show some support.